Private duplex living just steps away from the beach. Are you looking for an alternative to a ‘big company’ vacation rental? 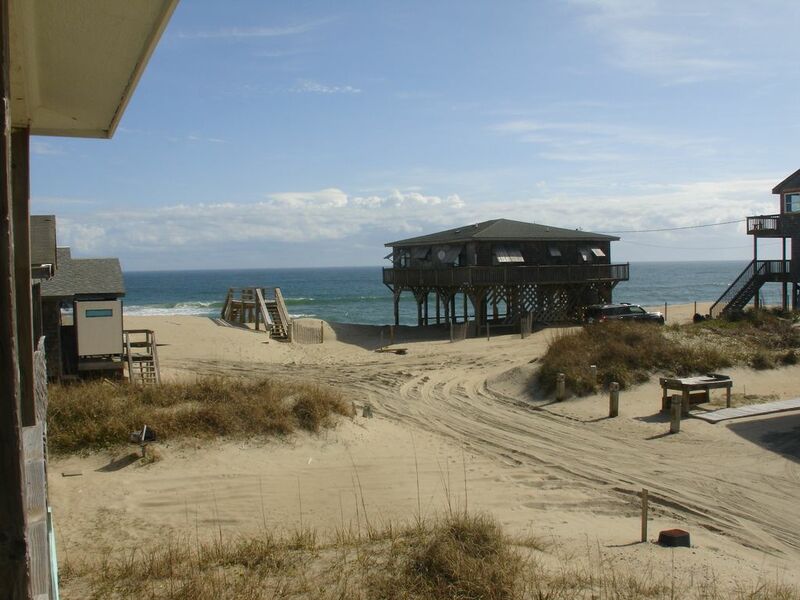 We invite you to share our duplex, just 3 lots off the beach in Buxton, NC. If you’re looking for the rare combination of a quiet location with easy beach access, as well as the convenience of being able to walk to shops, restaurants, a bait and tackle shop and putt putt – you’ve found it in Stones Throw. Our's is a family owned duplex, managed by ourselves from just 5 doors away on Cottage Avenue. Both levels of our duplex are customized to cater to couples, both young and old. The top level suite features wonderful ocean views, a large living room, separate dining area, well-appointed kitchen (sorry – no dishwasher), comfortable bedroom with queen bed and private bath. We supply all linens, bath towels, soap products, kitchen supplies, and even a hair dryer! For your entertainment, we include free WiFi, TV;s in the living room and bedroom (Dish) and DVD player. Of course, you’ll have your own washer, dryer, iron and ironing board. Outside, you have the use of the outside shower (hot and cold water with separate foot spray), and fish cleaning table. Each level has a dedicated park grill located on opposite sides of the property for grilling privacy. 200 feet from getting wet, a lighthouse that sweeps the neighborhood and the ever-present sounds of the ocean serve as constant reminders that you are truly at the beach! As we live just down the street, we believe we offer both the attention and privacy you need to make your vacation special. NO DAMAGE DEPOSIT! Please note, in season we rent Sunday to Sunday...after Labor Day, 3 night minimum. TRAVEL INSURANCE; We encourage all guests to purchase travel insurance should their vacation plans be interrupted by hurricanes, family issues or other unforeseen events. Pets allowed after Labor Day..breed and weight must be stated and a $25 fee will be added to your quote. Enjoy our duplex without climbing stairs! Consider our downstairs unit also listed with VRBO, #572428. Vacationers to the OBX since the 60's, we bought our first beach house in kill devil hills, then mistakenly sold it for a lakefront property on lake champlain (where the water is NEVER warm). having learned our lesson, this is our second and our favorite beach house. 2013 was our first year in the VRBO family of vacation rentals. We thoroughly enjoyed the experience! Location is excellent, just steps from the beach. Our goal is to provide spacious living for couples and the privacy that goes along with it. Although built in the 60's, our duplex has largely been renovated for the benefit of our guests. Cottage Ave is the locals' favorite beach, a dead-end street that disappears into the sand and waves. The neighborhood is quiet, the ocean sounds drown up most other distractions, and you have all the conveniences of home (except for a garage). New for 2018, a wide and deep beach in Buxton! The Beach Nourishment project of 2017 has created the deepest beach in memory, it has to be seen to be believed. In fact it is almost too deep as it is now a long walk to the surf. By design, some of added sand is sacrificial, so we expect some erosion (courtesy of winter noreasters), but hundreds of feet of beach is something we have never seen before. For updates (they are finishing up north of Buxton now) visit Dare County's "More Beach to Love" webpage. Updated bathroom with modern tub, toilet and vanity. You can hear it, see it...even smell the difference when you are this close to the beach! With the beach nourishment project completed we have a view of an expansive beach here in Buxton. In our 50 years of coming to the OBX this is the deepest beach we have ever enjoyed! Stacked washer/dryer in custom closet. High speed wireless internet included, upgraded speed. Bath towels only. Should your circumstances limit your luggage capacity (ie airline travel), by request we can furnish beach towels. Large table in our dining room, perfect for spreading out the Sunday paper! Satellite TV is provided by Dish Network. Private covered deck on south and east sides. Beautiful location, wonderful cottage! Decorated with a coastal, beach theme. Most comfortable accommodations. Everything you will need for a great beach stay is in this cottage. We had a relaxing Thanksgiving at Stones Throw! We will be back! Awesome, affordable place to stay! We thoroughly enjoyed our time in your lovely rental, complete with all the amenities we could possibly need. Being so close to the shoreline with a fantastic view of it, made it possible for us to unwind and relax without effort. We look forward to making our visits a recurring annual event and are already looking forward to next years trip. A Slice of Beach Paradise! This is our 2nd time staying at Stones Throw (2nd floor). We found our slice of beach paradise 2 years ago, by chance. Coming down for over a decade, Rodanthe, Avon, Waves, we had done the big homes with multiple family members and lots of kids. We love our family and kids but staying here for a week, just the two of us, has become a necessity for us. We are able to recharge and clear our heads. Buxton has it all. We biked to the Hatteras Lighthouse and beyond thru back roads. We also kayaked thru the marshes in Hatteras (amazing wildlife in the early morning). With attention to details, tastefull decor and cleanliness, the house is fresh, modern, and cozy with a sun kissed porch for morning coffees. My wife's favorite is the outdoor shower. Literally a 'stones throw' from the beach, we would rather eat all our meals on the front deck than in a noisy air conditioned restaurant. Deck views to the surf and quiet (no big homes with pools nearby and noisy neighbors, "been there, done that"). The owners Kathy and Mark embody the spirit of the Outer Banks. They are gracious and giving hosts. If you want a non commercial, well kept, local and quiet retreat, Stones Throw should be your next destination in OBX. We loved the location and the size and amenities were perfect! We would definitely stay here again. Kathy and Mark were attentive and available if needed. Having never been to Buxton, we were lucky enough to book a week at Stones Throw in July. After spending many summers in Nags Head and Kill Devil Hills, Hatteras was a nice change of pace that allowed for us to really unwind. The beach is just steps away, the town is small but has everything you need, and the house was clean and well kept. A few of the things that were nice that weren't advertised was the completely open beaches if you walk a quarter mile down the shore, being able to have fires on the beach, and the lack of other houses on the island. All in all, it was a great stay! Thanks for having us. We are located in an area where every road dead-ends into the Atlantic ocean. The Cape Hatteras Lighthouse sweeps through the neighborhood at night time. The nearest traffic light is 7 miles to the north. Within walking distance are restaurants, bait and tackle shops, ice cream and putt putt golf venues.